“I can’t believe it,” Sue said. “I can’t believe it either,” I said. 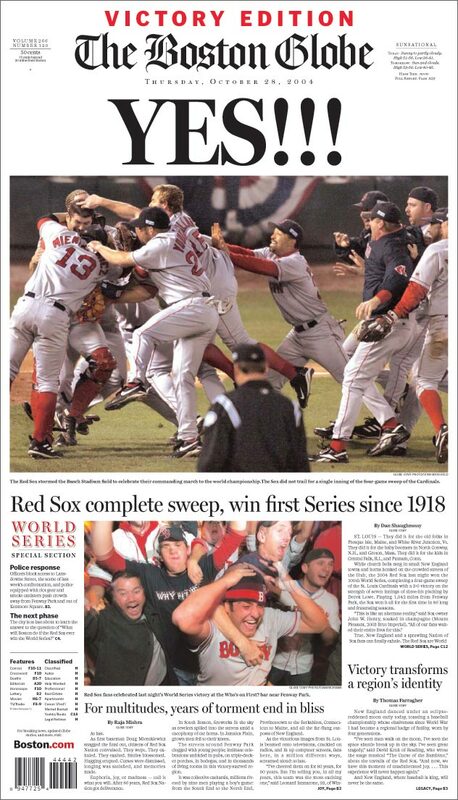 The Boston Red Sox had just won the World Series. Under a blood-red lunar eclipse, surely a sign of divine providence, the Red Sox had just swept the Cardinals in four straight games. The announcer was reminiscing about all the famous Sox players who never saw the series win, and then wondered how many of us have lost family members who were lifelong Sox fans who wanted to see just one series win? I nodded to the TV; I’d been thinking of Dad all night, and when the Sox won, I called Mom. “I’m thinking of Dad and I’m getting all teary-eyed,” she said excitedly. “Me too!” I told her. Dad, with whom “Red Sox” was synonymous, has been gone 20 years now. The dream he hoped for all his life had finally been realized. “I hope he’s watching the game,” I told Mom. “I know he is,” Mom said. I could hear she was filling up. Twenty years later, her love for him is still so strong. We talked for a while; it felt so good to share this “Dad moment” with Mom. A little later, I saw that Sue was starting to nod off on the couch and I jumped onto the computer to capture some of the stories on the Web, and then returned to the after-game show. I was so impressed with the Red Sox and how — like the Patriots three years ago and since — they came together as a unified team, focusing only on each game, without arrogance, just playing their best. I was so impressed by the players. As reporters asking each player what would happen next year, what trades would occur, each Red Sox player smiled and said, “That’s a question for another day. Tonight we celebrate!” Cherish the moment! But as I saw the riot police moving people peacefully through Kenmore square, I thought of those who weren’t around to cherish the moment. I went outside and looked into the clear cold sky at the moon and stars and talked to Dad. I told him that the Red Sox had just won the World Series. That it had been a great series and that he could rest in peace. I also thought about the death of someone I never met — beautiful Victoria Snelgrove, whose senseless and needless death will forever haunt the Boston Police and the city of Boston. Let us pray she rests in peace, that her family — someday, somehow — will know some level of peace. We also pray that her death will be the wakeup call that when all is said and done this is just a sport, a game, and that the behavior of the violent revelers — and the tragic mistakes made by the police that night — will never happen again. With that prayer, I went to bed. The next morning, the radio was playing U2’s “It’s a beautiful day,” and it really was — the sky was an unbelievable blue and everyone was so happy despite a universal lack of sleep. Total strangers were conversing on the commuter train. The Patriots continue to make us proud (and will keep winning), but this is the time for the Red Sox. Cherish this moment. Give this great team their due. They have earned it. The Red Sox World Series shirts arrived in Filenes at 11. The line stretched through three departments. At the corner of Washington and summer, a truck dropped off dozens of bundles of Heralds and Globes; the line to purchase them stretched for blocks. Street vendors took “Red Sox World Series champion” shirts out of cardboard boxes. At work, everyone was tired. I doubt anyone in the city got much done. It didn’t matter. We were just enjoying the day — this beautiful day. For far too long we’re endured the Yankees scorn, the curse of the Bambino, and mean-spirited jokes and the rallying cry of “Just wait till next year,” sometimes on opening day. It’s not a dream, it is not a hoax. They did it. 1918 is now just a memory. The curse is dead. The world did not end. 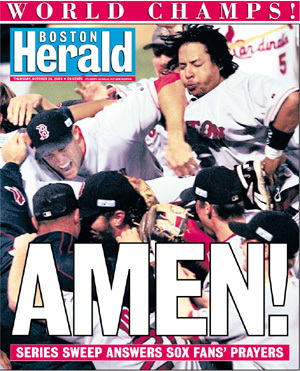 The Boston Red Sox are the world series champions. Stop and cherish this moment. Take pictures. Buy the shirts and hats and extras for your kids — they will thank you later. Let’s not rush ahead yet — there will be plenty of time for the Patriots, Celtics, and Christmas shopping and other distractions. For this all too brief moment in history, let time slow down just a little and realize that something even more extraordinary and rare then the lunar light show that Wednesday night has happened. Let’s not forget all those who have died waiting to see this. Their dreams — the impossible dream — has come true. Congratulations Red Sox, and on behalf of my dad and the hundreds of thousands who never who never stopped believing, thank you. We believed. Some of us have believed for 86 years. And my God, victory never tasted so sweet.